In recognition of her commitment to community engagement and her efforts to create new and innovative partnerships for the university, FIU has appointed Irma Becerra-Fernandez its vice president of Engagement. Becerra-Fernandez, formerly vice provost of academic affairs and a distinguished professor in the College of Business Administration, has led the Office of Engagement as interim vice president since May 2012. 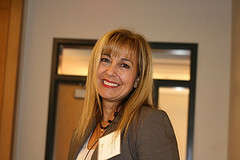 Irma Becerra-Fernandez has been interim vice president of engagement since May 2012. The office provides leadership for the development and coordination of partnerships at the local, state, national and international levels with the goal of aligning FIU’s instructional, research and creative initiatives with local and global needs and priorities. As vice president, Becerra-Fernandez oversees several key university initiatives including ACCESS, an achievement-oriented partnership with Miami-Dade Public Schools; Life Sciences South Florida, a consortium of organizations dedicated to the development of the life sciences industry in South Florida; and the Beacon Council’s One Community One Goal Academic Leaders Council, a collaborative of leaders of educational institutions of Miami-Dade County, from high school to higher education. She is also spearheading the university’s efforts to create an internship program that will offer students the opportunity for practical experience that will allow them to apply what they have learned in the classroom to enhance their skills in the workplace. Becerra-Fernandez, who was born in Cuba and grew up in Puerto Rico and Miami, began her career at FIU in 1994 when she graduated as the first woman to receive a PhD from FIU’s College of Engineering. Her research focuses on knowledge management, business intelligence, enterprise systems, disaster management and IT entrepreneurship. She has consulted with NASA and other federal agencies in the area of knowledge management practices, including designing a KM strategy for the Kennedy Space Center. She has been the recipient of numerous awards at FIU, including the 2004 Outstanding Faculty Torch Award, presented by the FIU Alumni Association, the 2006 FIU Faculty Teaching Award and the 2001 FIU Faculty Research Award.